actress/model Shannon Tweed for over 12 years. * Gene's mother Florence is a Nazi concentration camp survivor. * Gene was named after his father: Chaim Witz. * Gene's parents are divorced. * Gene is an only child. a branch in Brooklyn, NY. * Gene used to publish his own comics and horror fanzines as a teenager. to the bass after becoming a Beatles/Paul McCartney fan. * Gene has a teaching degree from Richmond College in Staten Island, NY. He taught English at a public school in Spanish Harlem, NY for 6 months. (Man Friday) for "Vogue" and "Glamour" magazines. * Gene was taught how to fire breathe by a magician named "Amaze-o." * In the mid 70's, Gene wore braces on his bottom teeth. * In the early 80's, Gene had cosmetic surgery to reshape his nose. Records. The deal never went through. Black 'n Blue, Wendy O' Williams, EZO and Doro Pesch. "Miami Vice" and the HBO series "The Hitchiker." * Gene was offered the lead male role in the 1983 movie "Flashdance,"
but turned it down in fear of hurting his "demon" image. * Gene has a famous sweet tooth! His favorite food: cookies. he has dated include Cher, Diana Ross and of course, Shannon Tweed. 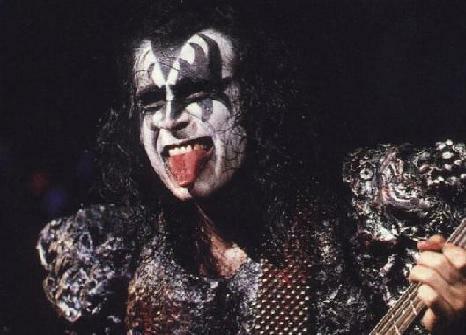 * Gene was best man at Paul Stanley's wedding in 1992. Gene's page has been visited times.